Document dated 1628, March 26th - Kan'ei 5, Mid-Spring, 21st day. 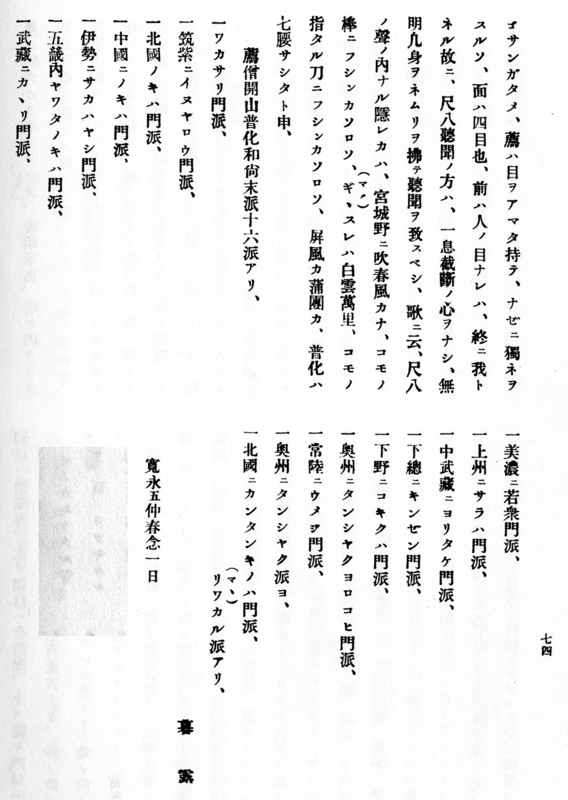 The very mysterious Fuke Shakuhachi document Kaidō honsoku was - apparently - created by one or more anonymous Fuke-komosō mat monks in 1628 (early Edo period). Although the original document scroll has been reported missing (if not simply stolen!?) from its former owner, the Zen temple Kōkoku-ji in Yura, Wakayama Prefecture, fortunately, prior to the loss, the text of the document was carefully copied and published, and thus preserved, in a way so as to be studied in rather some detail, even after the alleged disappearance of the original manuscript itself. In Sankyoku No. 188, Tokyo, Nov. 1937, pp. 20-31. 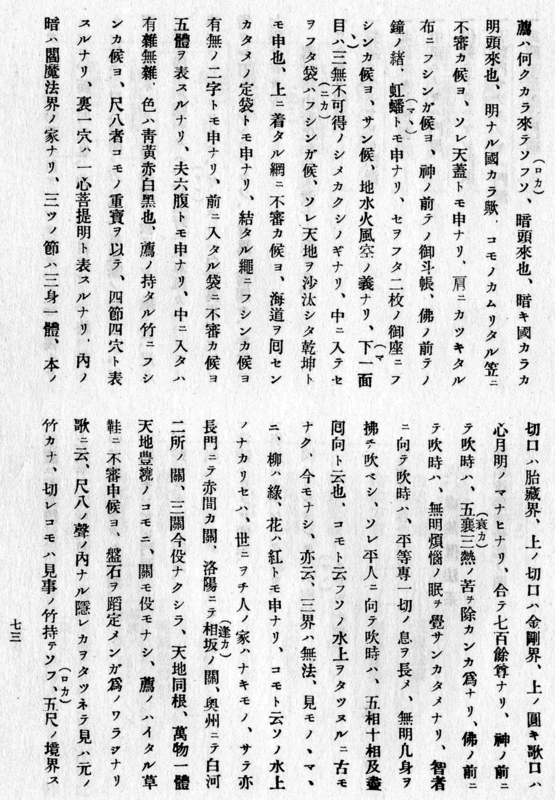 Mori Hikotarō, editor: Shūhū Yokō. Publ. by the Kōkoku-ji, Yura, Wakayama Prefecture, Japan, 1938, 1981, pp. 72-74. 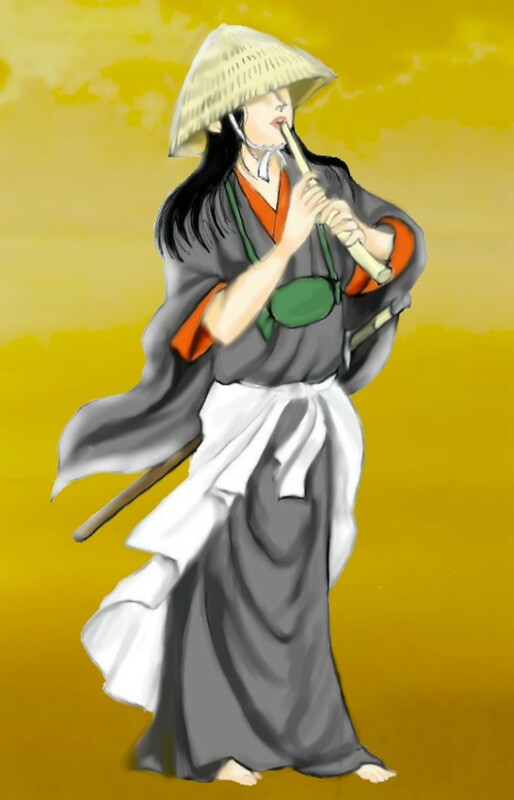 Nakatsuka Chikuzen: Kinko-ryū shakuhachi shikan. Nihon Ongaku-sha, Tokyo, 1979, pp. 271-273. Modern version published by Nihon ongaku-sha, Tokyo, 1981, pp. 186-188. Takeda Kyōson: Komusō: sei to zoku no igyōsha-tachi. Sanitsu Shobō, Tokyo, 1997, pp. 173-178. Shiryō to tomo ni tadoru shakuhachi no rekishi. Shuppan Geijutsu-sha, Tokyo, 2005, pp. 123-124. 'komosō', "mat monk" - NotaBene not a 'komusō'! Here follows my translation into English, based on the version which was originally presented in my M.A. thesis in Japanology and accepted by the University of Copenhagen, Eastasian Institute, in 1987, as well as the Tai Hei Shakuhachi edition of the work which was published internationally in 2003 by Monty H. Levensom, Taihei Shakuhachi, Willilt, Califormia, USA. The presentation of the translation has once more been updated as of November 24, 2018: All paragraphs have been renumbered. From where does the Komo come? Does he come from the Realm of Obscurity? Does he come from the Realm of Clarity? Oh, how mysterious is the basket hat that the Komo is wearing on his head! It is also called the ‘Tengai’. Oh, how mysterious is the piece of cloth that he carries over his shoulder! That is the ‘Dots-and-Cross’ patterned curtain in front of the Shintō Dëity and the Bell String in front of the Buddha, and it is also called the ‘Rainbow Coil’. Oh, how mysterious is the double-leaf, fine straw mat that he carries on his back! It represents the Tripartite Climatic Periods and the Five Elements: Earth, Water, Fire, Wind, and Space. The first layer signifies the Total Concealment of the Ungraspability of the Three Existences: Past, Present, and Future. How mysterious is the case that he carries on his back, inside the rolled up strawmat! It is also called the ‘Kenkon’ which proclaims the Interrelatedness of Heaven and Earth. Oh, how mysterious is the net that he has wrapped around the things! It is called the ‘Prescribed Bag’ for accomplishing an exhaustive roundtrip through all the provinces. Oh, how mysterious is the rope with which everything is tied together! It is also called the ‘Two Concepts of Being and Non-Being’. Oh, how mysterious is the purse that he carries placed on his chest! It expresses the Totality of the Human Body. It is also called the Six Internal Organs. It contains miscellaneous things, their colors being bluish-green, yellow, red, white, and black. Oh, how mysterious is the bamboo flute that the Komo carries! Any attempt at answering the question would be just as meaningless as saying ‘the willow is verdurous, the flower is crimson’! Instead of a place of origin, the Komo are scattered in the world without such a place to call home. And now being deprived of employment anywhere, be it at any of the three barriers of Akama-ga-seki in the Nagato Province, Ōsaka-no-seki at the [old] capital [Kyōto], or the two checking stations of Shirakawa in Ōshū, the Komo who abundantly wander the world, to whom Heaven and Earth have the Same Root and All Creation is One Body, have neither confinements nor attachments. Oh, humbly speaking, how mysterious are the straw sandals that the Komo is wearing! They represent the proper footwear for the steadfast treading his way [on giant rocks] in the footprints of Banzan and Sekitō. The competent Komo possesses a magnificent piece of bamboo. - and therefore he sleeps alone. The surface has four eyes [or, stitches? - or, the face has four eyes?]. How mysterious, indeed, is the Komo’s staff! How mysterious, indeed, is the sword that the Komo is carrying! Even at Banzan’s deathbed Fuke made a somersault over the screen and mattress, it is being told! The Inu-yarō Branch Sect in Tsukushi. The Hokkoku Noki-ha Branch Sect. The Noki-ha Branch Sect in Chūgoku. The Sakabayashi Branch Sect in Ise. The Gokinai Yawata Noki-ha Branch Sect. The Kagari Branch Sect in Musashi. The Wakashû Branch Sect in Minō. The Sara-ha Branch Sect in Jōshū. The Yoritake Branch Sect in C. Musashi. The Kinzen Branch Sect in Shimōsa. The Kogiku-ha Branch Sect in Shimotsuke. The Tanjaku Yorokobi Branch Sect in Ōshū. The Umeji Branch Sect in Hitachi. The Additional Tanjaku Branch in Ōshū. The Kandan-ki no ha Branch Sect in Hokkoku. These are the rustic and humble branches. Boro — ‘He/they who live(s) like the dew’. Kan’ei 5, Mid-Spring, 21st day. "When Hottō Kokushi returned to his native country, he was accompanied by four Buddhist laymen: Kuo Tsuo. Li Cheng, Tseng Shu & Pao P'u (in Japanese: Kokusa(ku), Risei, Sōjo and Hōfu)." "The Fundamental Doctrine of Fuke Shakuhachi Itineracy. Issued from Yura in the Kii Province." I am quite convinced that both of these two printed opening sentences must have been added to the original document - or rather, to some or more copies of that - sometime after its actual completion in 1628 and I have therefore omitted the translation of those two particular sentences in the above presentation.